One of the biggest news within the global investment and PropTech community at the beginning of 2019 was about Norway’s sovereign wealth fund. The wealth fund, which is one of the biggest sovereign funds worldwide and manages state funds of close to €1trn AUM, announced it will cut back their direct real estate investments and own RE investment arm. Interesting is, it was not the asset class per se, but the high management fees Norwegian sovereign fund cited as their main reason – as much as 5 times higher compared to other comparable asset classes. Due to the fact that there is still a substantial amount of dry powder out in the real estate market (quite substantially, indeed, $295bn according to IPE), a few eyebrows were lifted. Isn’t real estate any longer a lucrative asset class with a relatively good risk-adjusted return for the time being and years to come? If one of the biggest sovereign funds is cutting back its real investments, what should smaller players think? How to solve the problem of high management fees? I think most of us can agree to the fact that the real estate market is still far away from a transparent and information symmetric market. In addition, the management processes – all the way from the investment and fund management to asset and property management down to facility management – are manual, tedious and labor intensive. There are a lot of information silos and broken processes adding costs throughout the value chain. This leads simply to inefficiencies and unproductive work. Data does not flow – except through manually crafted Excel spreadsheets between individual parties. However, the good news is: when there’s a sin, there’s salvation – PropTech that is. By simply deploying new, modern digital tools across corporations and partners a lot can be improved to create a single point of view across asset classes, geographies, currencies, metric systems, and languages – and increase transparency and data sharing between parties. Let’s take a concrete example (picture below). When I founded Assetti, I knew we were not able to fill all the gaps and discrepancies within the Commercial Real Estate market. It was simply impossible – given the share size and multitude of players. However, by creating an app which can talk to others through a RESTful API, the story is different. The data flows – securely and in a managed way. 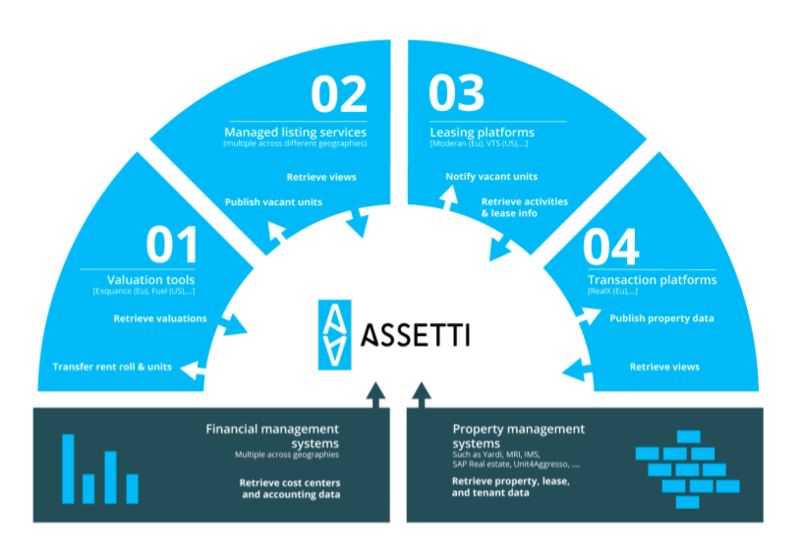 To put in concrete, an app like Assetti can integrate to legacy silos whether that be local property management or accounting software (which, by the way, exist in plethora across Europe alone) to create a coherent data set across geographies and jurisdictions. Then, not taking one, but multiple best-of-breed user experiences, one can connect seamlessly into different processes. 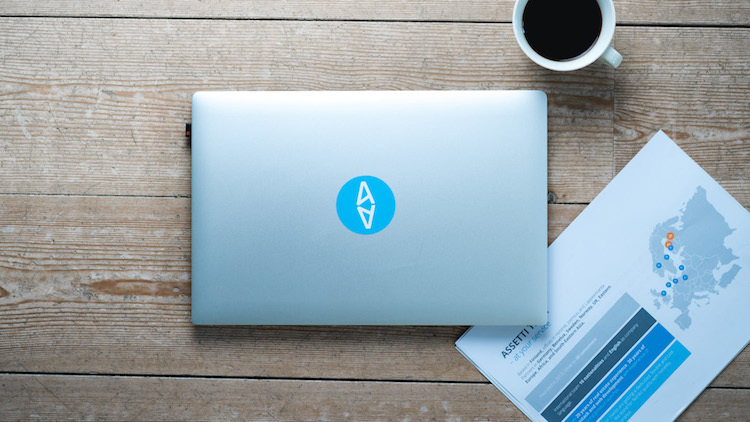 You can connect Assetti to a valuation tool to interchange the basic property data, rent rolls, and financial data. Then, return back the updated valuations to show your year-on-year yield development. How often? As often as you want! No more discrete once a year manual exercises which are time-consuming and costly. Then, if you want to test the market or even sell your property, simply publish it onto a transaction platform for a discrete viewing. No need to construct and collect the data manually. And what would be the case with leasing processes? If you want to speed those up, why not to connect to any listing service and publish your vacant units there? And do not worry – you can still use your trusted broker. Connect to newly bred applications, and you will have an up-to-date picture where you are standing with your leasing activities. All of this is no longer a promise but working and tested technology being around more than 5 years. So, what’s the takeaway? Simply do it. You can drastically save time, money, and increase efficiency and productivity across the value chain. Most importantly: you’ll gain more business. Digitalizing processes alone with the help of modern PropTech would make globally savings worth of €50bn annually according to my own not-so-scientific estimate. And ultimately, for the Norwegian oil fund to reconsider its decision! Real estate is management intensive after all, but a lot can be done to make it more effective – thanks to PropTech.